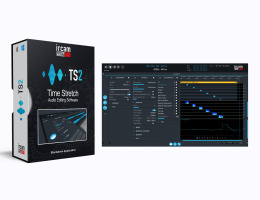 IRCAM Lab "TS" stands for "Transpose/Stretching" and is a powerful stand alone software application that revolutionizes the way audio signals can be processed. Unlike other time stretching applications, "TS" uses an advanced phase vocoder engine (SuperVP) as well as the analysis/synthesis functionalities of "AudioSculpt", providing high-quality sound processing in real-time. This technology offers amazing results even when used to transpose or stretch audio waveforms radically. It is able to transpose and/or pitch a WAV or AIFF audio file with extremely accurate results and minimal artifacts making it possible to process professional recordings with transparent results. A life saver for audio engineers and broadcast technicians! You will be able to adapt the length of your compositions with ease to fit the needs of your project. If your song has to end more quickly or be extended for any reason, it is a click of a button away. and you will hear it immediately. Film and advertising work with their demands for different lengths of material will be instantaneously available to deliver the new time format. Your singer can't reach the lowest note or highest note in your piece, transpose it up and down in real time and let them try it right away. All this in a simple user-friendly interface with a sound quality and musicality that is astonishing. The demo is a fully functional, 15 day trial, version without any limitations. You may download directly from the bottom of the product page HERE and install the full IRCAM Lab "TS" software. Be Careful, it's addictive!